New York Times best-selling Author S. M. Stirling's first collection gathers his most interesting and evocative short stories, drawn from the length of his professional career. More than 100,000 words of fiction, including an original story, make this book a must for fans of Stirling's work. Whether Stirling is exploring alternate histories, chronicling military sf exploits, or off-kilter contemporary settings, his insightful characterizations and compelling plots are distinct and memorable. Egyptian chariots carry shotgunners and haul heavy cannon into battle, Roman centurions fight at the whims of bug-eyed monsters, vigilant National Guardsmen hold the line against cannibalistic illegal aliens, and American soldiers wander savage lands, leading a massive AI-controlled BOLO tank, as they struggle to return home to a United States that no longer exists. Through themes of duty, honor, and fortitude under fire, New York Times bestselling author S. M. Stirling presents thirteen stories of military men and women pushed to the point where myth and technology collide. Showcasing Stirling's trademark military action, jargon-heavy dialogue, and conflict-driven storytelling, these thrilling tales of alternate histories, apocalyptic futures, and hard-driving military Science Fiction demonstrate why Stirling has long been a fan favorite. The limited edition will be signed by Stirling and will contain a story not in the trade edition. Limited to 150 copies. 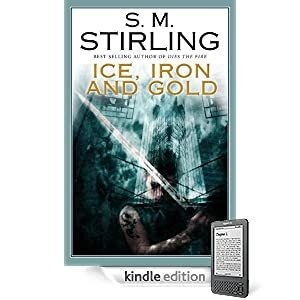 Or purchase Ice, Iron and Gold as a DRM-free e-book in the format of your choice through WebScription.net.